FISTS supports the use, preservation and education of Morse code. The club is devoted exclusively to CW operators, CW operating and people who are passionate about Morse code. FISTS CW Club in Europe is the founding chapter of the club. Please visit the News page for a full list of recent and older news items. FISTS HQ welcomes new members who have a passion for Morse Code. 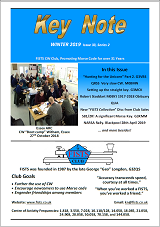 The FISTS Club is one of amateur radio's fastest growing organisations. It's a unique club, founded and maintained on solid principles using radio's oldest and yet most reliable communications mode - CW! Why not join us? The FISTS Club, (International Morse Preservation Society) was founded in 1987 by the late George "Geo" Longden G3ZQS of Darwen, Lancashire England, after recognising a need for a club in which veteran operators would help newcomers and less-experienced operators learn and improve CW proficiency. During the first year, membership reached 300, most of whom were in Great Britain and Europe. The original Introduction to FISTS by Geo holds as true today as it did when he wrote it. Geo also explains how he chose the name FISTS. The North American Chapter (now known as FISTS Americas) was formed in 1990 to assist 11 members in the USA receive the newsletter and as a banking convenience. Nancy Kott WZ8C of Hadley, Michigan was named US representative, a position she held until sadly she became a Silent Key in 2014. The FISTS Down Under Chapter representing New Zealand and Australia, was formed in 1998 by Ralph Sutton ZL2AOH to provide a similar service to Australasian members. From a ZL / VK membership of four including a JA and an FO, the FISTS Down Under Chapter has grown in strength to currently 118; 31 New Zealand members and 87 Australian members. The East Asia Chapter was formed in 2004 by a few Taiwanese and Japanese members to provide East Asian members with various services in their native languages. Acknowledgements: Thank you to Dennis K6DF, Bill NT9K and Billy AB4RH for permission to use photographs from their key collections.